The magnificent 63 metre ICON Yachts’ superyacht, Baton Rouge, has been nominated as a finalist for the World Superyacht Awards of 2011. Please go here for high res yacht images of Baton Rouge. Boat International Media revealed the nominations list for the World Superyacht Awards 2011. The awards will take place on the 7th May 2011 in London. ‘Baton Rouge’ is nominated amongst six other stunning vessels in the Best Displacement Motor Yacht of 1,300GT to 2,999GT, ca 60m – 84m category. Now into its sixth year, the World Superyacht Awards honour the finest new superyacht builds delivered to their owners in the past twelve months. Superyacht Baton Rouge, is the most recent launch of 62,5M superyachts completed by ICON Yachts, who are quickly establishing a name for excellent craftsmanship and innovative construction methods with leading edge technology and best value in Dutch Built Quality. The theme of space continues through to the deck areas of the Icon yacht Baton Rouge which are just as expansive with great outdoor spaces for lounging and dining, a pool with jet stream, a dedicated sundeck (which converts to a party deck) with an enormous circular sun pad, and an inviting beach club lounge at sea level. A gym and a very comprehensive inventory of water toys and tenders along with state-of-the-art entertainment and communications systems complete the picture of a yacht which has been conceived by a highly experienced team to deliver the very ultimate charter experience. “The construction of such a yacht is an incredible team effort, under the guiding baton of the Client. The enthusiasm shown by all at ICON, from the shop floor to the boardroom, has been rewarded by a truly remarkable achievement, a yacht of the very best quality ready to sail anywhere in the world. “Her owners have inspired a wonderfully varied and complex interior, where color and texture come together to create a fabulous feeling of spirit and originality, Bravo Icon Yachts! Being able to tie together complimenting styles with lavish attention to detail is a skill which requires a great design confidence and an empathy for the client. Baton Rouge is a true reflection of the owner‟s style, passion for colour and great sense of fun all brought together within a fabulous Tim Heywood exterior.” Justin from Redman Whiteley Dixon. Fully stabilised and optimised in every respect for luxury living afloat, her extensive interior guest areas comprise multiple lounges and a choice of dining options, which cohesively encompass both townhouse elegance and beach house chic to suit one’s mood. Accommodation for 14 guests in 7 large cabins is configured as a superb 100 sqm master suite on the main deck, two VIP cabins on the upper deck, plus two doubles and two convertible doubles/twins on the lower deck. 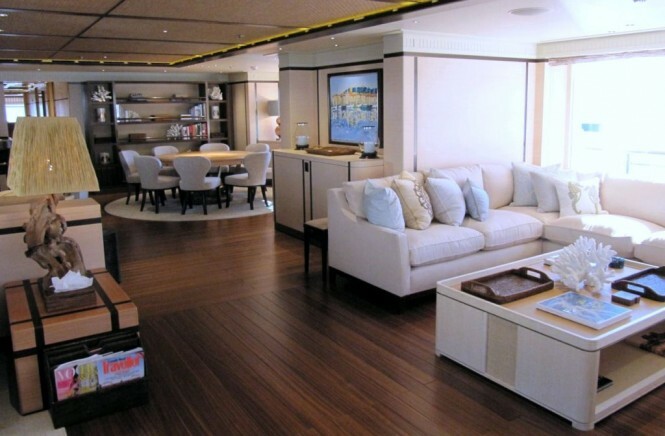 The main saloon is the more formal area of the yacht, neutrally decorated. Forward there is a dining table that seats 14. The focus is inwards and on the occupants rather than outwards – even the tray ceiling draws the eye to the centre of the room. Full of wonderful textures, ranging from beautiful woods, leathers, marbles, nickel and bronze details, to hand-crafted furniture and original artwork, Baton Rouge’s eclectic contemporary interior is both serene and stylish. The view down the centreline of the upper saloon emphasizes Baton Rouge‟s length. This deck is more relaxed in style and ambiance, featuring various distinct areas for playing games, reading books or drinking at the bar. Guests can also take in the views in the observation lounge. The theme of long vistas is repeated on the upper deck where the full beam observation lounge offers uninterrupted spectacular viewing through the enormous semi circular window panes over the fore deck. A large playing table by Silverline to the aft stbd side is well equipped to convert into any card playing setup preferred. Adjacent to the beach club and its air-conditioned lounge is the fully equipped dive room and a gymnasium. An impressive quota of toys includes a luxury Meyer limousine tender stowed aft on the main deck, plus wave runners, sea bobs, kayaks, windsurfers, Kitesurfers and Bobdives. The accommodation deck – and there are just four spacious guest suites here, the other two being two decks above – is a showstopper. From the spiral staircase amidships, guests descend to a lower lobby that leads not only just to their suites but also down a sweeping corridor to the beach club astern. Additional regulations: The yacht Baton Rouge was built to the requirements of the Isle of Man. Complying with LY2 code. Model testing: The hull was tested in the model basin of the MARIN Institute in The Netherlands. In addition a model of the yacht (hull and superstructure) was tested in the MARIN sea keeping basin. Interior designer Crew Areas: The crew areas were designed by Redman Whitely Dixon and fabricated by Metrica. The interior arrangements will meet the new ILO requirements. The interior styling of the yacht Baton Rouge wheelhouse was carried out by Redman Whiteley Dixon, while the technical design and engineering of the consoles was carried out by Radio Holland and Radio Zeeland under the supervision of the ICON Yacht design team. The co-operation between RH and RZ was special for the purpose of this yacht and has resulted in the first truly “glass bridge”. This will be the ICON standard and will undoubtedly be the new standard for other quality yacht builders. Two MTU® four stroke, 12 cylinder V marine diesel propulsion engines, model 12V-4000-M71, Maximum Continuous Service Rating 2480bhp/1850kW at 2000 rpm. Please contact CharterWorld - the luxury yacht charter specialist - for more on superyacht news item "ICON Yachts Superyacht Baton Rouge nominated finalist World Superyacht Awards 2011".